where Ro is the mean radius of Earth (6,370.949 km), c- the input sound speed at depth z- and c\ the corrected sound speed at corrected depth Zi. The effect of curvature is more than just a matter of chords versus arcs of great circles. Rather, the important feature is that the contours of constant sound speed (as represented on a range-depth plane) are actually concentric spheres instead of flat, parallel planes. The differences in ray angles as calculated by Snell's law produce effects of potential importance to sonar performance predictions. A detailed comparison between state-of-the-art ray theory and experimental TL data (Pedersen et al., 1984) revealed that Earth curvature corrections to the sound-speed profile produced model predictions that were in better agreement with the data than would have otherwise been obtained. The effect of curvature was to reduce the range to the leading edge of the first convergence zone by about 1 percent. Errors might be expected to increase with increasing range. Yan (1999) noted that the incorporation of spherical-Earth-curvature corrections into 2D ray equations considerably extended the applicability of these equations in certain classes of 3D problems. Propagation models generally require sound-speed data from the surface of the ocean to the sea floor. When the local water depth exceeds the limits of available sensing devices such as the XBT, the required surface-to-bottom sound-speed profiles are often derived from a combination of in situ data for the near-surface (or shallow) layer together with climatology for the deep layer (Fisher and Pickett, 1973). A number of algorithms have been developed for automatically merging data from the shallow and deep layers. Statistical relationships based on oceanographic analyses are typically employed to associate the shallow-layer data with the most appropriate deep-layer climatology. This practice is usually satisfactory when the historical databases are characterized by high spatial and temporal resolutions. However, merging algorithms can occasionally introduce errors into the derived surface-to-bottom sound-speed profile as a result of curve-fitting artifacts or incomplete data near the juncture of the two layers. Additional errors may result from the measurement and digitization processes. This section will review specialized applications of underwater acoustic propagation models. Progress in these particular areas is advancing rapidly and the following sections are intended to identify areas of particular interest at the present time as well as areas that may be appropriate for future research. Methods by which to investigate the stochastic (versus deterministic, or completely predictable) nature of acoustic propagation in the ocean have been refined as part of ongoing, long-term projects. Such efforts are concerned with probabilistic predictions of the environmental limits to sonar aperture designs (Perkins et al., 1984). A workshop conducted at the US Naval Research Laboratory addressed the model and database requirements for current and new highly complex sonar systems (Spofford and Haynes, 1983). Among the topics addressed were estimates of both the first and second moments (variances) or spreads in space, time and frequency required in a variety of ocean environments to support the operation of current sonar systems and the design of advanced sonar systems. A review of stochastic signal modeling efforts (Wood and Papadakis, 1985) concluded that spread function models are efficient for computing lower-order statistics, although with limited capability. General-purpose Monte Carlo models are desirable for their higher-order capabilities, despite higher computing costs. In the so-called "model-based" approach to acoustic signal processing in the ocean, mathematical models of physical phenomena and measurement processes are incorporated into the processor. The inclusion of a propagation model in the signal-processing scheme introduces environmental information in a self-consistent manner. Furthermore, stochastic properties of the oceanic medium can be included in the model. Solutions using state-space techniques employ two sets of equations: the state equation and the measurement equation. The state equation describes the evolution in space of the modal and range functions while the measurement equation relates these states to the hydrophone array measurements. One specific implementation (Candy and Sullivan, 1992) cast the normalmode propagation model into state-space form, extended the formulation to a Gauss-Markov model, and applied the results to an ocean-acoustic signal-processing problem in the context of a horizontally stratified ocean with a known source position. A related implementation investigated the inverse reconstruction of a sound-speed profile from hydrophone measurements (Candy and Sullivan, 1993). The use of finite element techniques for computing underwater acoustic propagation has been studied as part of a computationally intensive probabilistic acoustics program, the major objective of which was to develop models for propagation of the moments of the acoustic field in regions where the ocean boundaries are random surfaces (Goldstein, 1984). The possibility of using exact techniques such as the FEM for solving the wave equation have been made more attainable by the augmentation of computers with array processors. Recent developments in finite element modeling include ISVRFEM (Pack, 1986), the FEPE (Collins, 1988a), the finite element ocean acoustic model (FOAM) (Murphy and Chin-Bing, 1989) and the seismo-acoustic finite element (SAFE) model (Murphy and Chin-Bing, 1991). Broadband (also referred to as pulse or wideband) propagation modeling is concerned with simulating the effects associated with the transmission of a signal characterized by a frequency spectrum (versus a single-frequency continuous wave). When considering such signals, the simplest approach has been to first calculate the geometric mean frequency fM), defined as /M = (f\fl)^/1, where f and /2 are the lower and upper limits, respectively, of the frequency band. The propagation of an equivalent signal at frequency /m is then simulated using one of the available propagation models. When the bandwidth is small, this approach probably generates a reasonable approximation. Otherwise, this approach may lead to substantial errors, particularly when the spectrum is not flat over the bandwidth, and other methods must be tried including Fourier synthesis and time-domain methods. In Fourier synthesis, multiple executions of an existing propagation model are performed over the frequency range (/1, /2) at a number of discrete frequencies at intervals Af, where Af might be 1 Hz, for example. The resulting transmission losses for each frequency in the bandwidth are then combined through an appropriate weighting and averaging process (i.e. and interpolation postprocessor) to arrive at the TL corresponding to the bandwidth. Examples of such multi-frequency extensions include the ray-theoretical model GAMARAY (Westwood, 1992), the normal mode model PROTEUS (Gragg, 1985) and the multilayer expansion model MULE (Weinberg, 1985a). Alternatively, the method developed by McDonald and Kuperman (1987) for modeling the propagation of a broadband linear pulse in a waveguide is one example of a broader class of techniques referred to as time-domain methods (Kuperman, 1985). In principle, the frequency-domain wave equation (valid for a single-frequency CW signal) can treat broadband signals by Fourier synthesis of the individual CW solutions over the frequency spectrum. In the presence of nonlinearities, however, interactions among frequency components invalidate the frequency-domain approach. In the time domain, the wave equation can be formulated using methods that remove such pathological limitations from the numerical solutions. In related developments, Porter (1990) developed a time-marched FFP (Pulse FFP) for modeling acoustic pulse propagation in the ocean. Collins (1988b) used the TDPE model to investigate the effects of sediment dispersion on pulse propagation. Orchard et al. (1992) developed the 3D TDPA (time-domain parabolic approximation) model for simulating pulse propagation in 3D ocean geometries. Jensen (1988) summarized wave-theoretical techniques suitable for the practical modeling of low-frequency acoustic pule propagation in the ocean. Jensen emphasized the computational efficiency of pulse propagation predictions using Fourier synthesis of existing CW propagation models based on normal mode and parabolic equation approaches. Jensen (1993) further explored these issues by placing particular emphasis on propagation in leaky surface ducts. Futa and Kikuchi (2001) investigated the use of the finite-difference timedomain (FDTD) method for pulse propagation in shallow water. 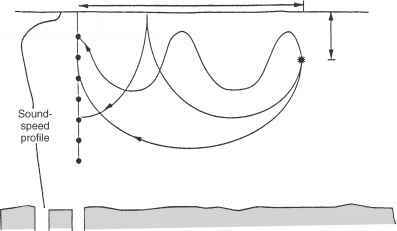 The FDTD method facilitates a direct analysis of the effect of sediment impedance on the time-depth pattern of the received acoustic pulse. The FDTD method was particularly efficient in analyzing the acoustic field in the vicinity of the sound source. By comparison, the normal-mode approach would have required a complicated analysis of both the discrete and continuous modes in the near field. Advances in the computational efficiency of propagation codes have facilitated the practical analysis of broadband sources using the waveguide invariant approach. The "waveguide invariant" summarizes in a single scalar parameter the dispersive characteristics of the acoustic field in a waveguide. Using a ray (versus normal mode) formulation, the invariant is computed in part by varying the ray launch angle about a mean value and then computing the corresponding changes in the ray-cycle distance and the ray-cycle time. The term "invariant" derives from the fact that the (computed) dispersive character of the propagation in the environment is nearly independent of the particular ray pair selected. This interesting approach was described by Brekhovskikh and Lysanov (1982) (and earlier by S.D. Chuprov). Song etal. (1998) and D'Spain etal. (1999) described practical applications of the waveguide invariant approach in realistic environments, including matched field processing. The use of matched field processing techniques in underwater acoustics has been explored by a number of investigators, and comprehensive overviews are available (Tolstoy, 1992, 1993; Baggeroer et al., 1993). This technique correlates the acoustic pressure field from a submerged source, as detected at each receiver in a hydrophone array, with the field modeled at the array by assuming a particular source position and ocean environment. Consequently, a high degree of correlation between the experimental and modeled pressure fields indicates a high probability that the source is located at the estimated position in the range-depth plane. The basic components of matched field processing are illustrated in Figure 5.14 (Tolstoy, 1993). Accordingly, this technique shows promise as a high-resolution localization tool. This technique can also be used to reconstruct prevailing oceanic conditions when the source and receiver positions are known a priori. A variety of mathematical estimator functions have been utilized to perform the comparisons between the experimental and modeled pressure fields. Figure 5.14 Illustration of the basic components of matched field processing. These include linear, minimum variance, multiple constraint, matched mode, eigenvector, maximum entropy, approximate orthogonal, variable coefficient likelihood and optimum uncertain field processors (Fizell, 1987; Tolstoy, 1993). The outputs of these processors are often presented graphically on so-called "performance surfaces" to facilitate identification of probable source positions. The ambiguity surface illustrated in Figure 5.14 is one example. The matched field technique has been found attractive for application to shallow-water geometries. For example, Bucker (1976) used a conventional cross correlation of the experimental and modeled pressure fields while Del Balzo et al. (1988) used a maximum-likelihood estimator. The maximum-likelihood estimator has also been applied to deep-water Arctic environments by Fizell and Wales (1985). Dosso et al. (1993) used matched field inversion to estimate properties of the ocean bottom. In as yet unpublished work, M. Snellen and D.G. Simons applied the downhill simplex algorithm to reduce the uncertainty in matched field inversion results. Westwood (1992) explored the use of broadband signals in matched field processing. In addition, D'Spain et al. (1999) developed an adiabatic normal-mode model to analyze broadband, matched-field-processing data collected in shallow water. The model incorporated the concept of "effective depth," which was first introduced by Weston (1960) for a Pekeris waveguide and later extended by Chapman et al. (1989) to include shear waves. In essence, the phase change associated with the reflection of a plane wave from a fluid-elastic interface at the sea floor is equal to that from a pressure-release boundary that is offset a distance below the true bottom. This offset, which is virtually independent of the grazing angle, can be calculated from available waveguide parameters. Thus, the normal-mode wave numbers can be provided by a closed-form expression rather than by more cumbersome numerical complex-root-finding techniques. Bogart and Yang (1992) used matched mode localization as an alternative to matched field processing and found that the matched mode ambiguity surface showed equal or improved (i.e. lower) sidelobes compared to that of matched field processing; moreover, it was easier to compute. Collison and Dosso (2000) documented a useful comparison of modal decomposition algorithms for matched-mode processing. A transmutation approach has been applied to underwater acoustic propagation by Duston et al. (1986). As described by Gilbert and Wood (1986), who also provided historical references to the literature, transmutation theory allows one to find an integral operator that transforms the solutions of a simpler partial differential equation into solutions of another, more complicated, partial differential equation. A third partial differential equation exists that the kernel of the integral operator must then satisfy. The advantage gained is that more freedom exists in assigning useful initial boundary conditions to the kernel. Thus, instead of separating the Helmholtz equation into two ordinary differential equations, it is separated into two related patrial differential equations, one of which is solved analytically and the other by a hybrid of symbolic and numerical computations. Chaos in underwater acoustic modeling has been explored by Tappert et al. (1988) and by Palmer et al. (1988a). They observed that ray path solutions exhibit "classical chaos," that is, unpredictable and stochastic behavior. The phenomenon of chaos in underwater acoustics is presumed to be caused by the exponential proliferation of catastrophes (in the form of caustics) due to the loss of control implied by the nonseparability of variables in the eikonal equation. Consequently, there exists a prediction horizon that cannot be exceeded even when the ocean environment is known exactly. The application of chaotic concepts to underwater acoustic propagation modeling has been further investigated by Brown et al. (1991a,b), Tappert et al. (1991) and Smith et al. (1992a,b). These studies have emphasized the practical importance of chaotic ray trajectories as limiting factors in generating deterministic predictions of acoustic propagation, particularly in the presence of mesoscale ocean structure. Collins and Kuperman (1994a) suggested that the computational difficulties associated with chaos may be overcome by solving eigenray problems with boundary-value techniques as opposed to initial-value techniques. The deliberate use of chaotic waveforms as sonar signals has also been investigated. One theoretical study (Alapati et al., 1993) used chaotic metrics (e.g. Rasband, 1990) and conventional ambiguity functions to evaluate the performance of several nonlinear waveforms after convolution with realistic ocean impulse-response functions. These impulse-response (or Green's) functions were generated using the generic sonar model (GSM) (Chapter 10, Section 10.4.4). Ziomek (1985: 4-5) discussed the mathematical formalism of impulse-response functions in a signal-processing context. 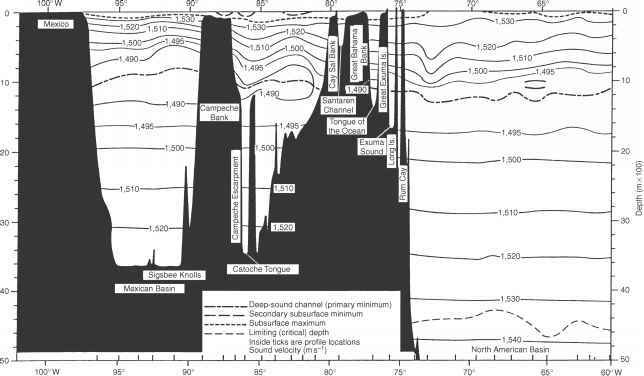 Because of their amenability to signal enhancement (or noise-reduction) techniques, chaotic waveforms have been suggested for use in bistatic active sonar systems operating in shallow-water regions (Chapter 10, Section 10.2). Time-domain analysis of ocean ambient-background pressure fluctuations collected at the Atlantic undersea test and evaluation center (AUTEC) during a mine-deployment exercise (MINEX) revealed a positive Lyapunov exponent, which identified the system as chaotic. The prediction horizon was confined to a few samples. Determination of the degrees of freedom was important for the construction of physical models and nonlinear noise-reduction filters, which were based on characteristics of the observed degrees of freedom (in this case, 9) from the background acoustic source. The magnitude of the largest Lyapunov exponent provided a measure of confidence for signal-state prediction (Frison et al., 1996). In nonseparable, range-dependent environments, ray paths can be chaotic, thus placing a fundamental limit on tracing rays by the classical shooting approach in which the launch angles of rays from a source point are varied until the rays intersect the receiver endpoint within specified tolerances. To circumvent this problem, Mazur and Gilbert (1997a,b) used Rayleigh-Ritz and simulated-annealing methods rather than minimizing the travel-time integral indirectly. The effects of ocean internal waves on long-range acoustic pulse propagation were analyzed from the geometrical-optics viewpoint by Simmen et al. (1997), who also investigated the chaotic behavior of rays and the micro-folding of timefronts. The extent of the region of the timefront in which strongly chaotic rays appear, and the strength of the rays' sensitivity to initial conditions, were found to depend on the average sound-speed profile, the source-to-receiver range and the internal-wave spectral model. Tappert and Tang (1996) found that groups of chaotic eigenrays tended to form clusters having stable envelopes. Sundaram and Zaslavsky (1999) studied the dispersion of wave packets using a parabolic approximation to the wave equation. They noted that, in a manner similar to that observed in quantum chaos, enhanced dispersion due to chaotic ray dynamics was counterbalanced by wave coherence effects. Modeling underwater acoustic propagation in three dimensions, sometimes referred to a volume acoustic field modeling (Chin-Bing et al., 1986), has assumed greater importance as sonar systems have become more complex (Jones, 1983). Ray theory and PEs can theoretically treat 3D propagation, although such implementations are rarely accomplished in practice due to computational complexity (e.g. Johnson, 1984). Therefore, such modeling is generally, but not always, accomplished by extending the capabilities of existing range-dependent (2D) techniques such as PE, normal mode and ray theory models to form composite 3D pictures. Such approaches are commonly termed N x 2D since the models are sequentially executed for N adjacent range-dependent (2D) radials (or sectors). Tolstoy (1996) stressed the point that N x 2D (sometimes referred to as 2.5D) approximations to full 3D modeling will fail whenever the out-of-plane energy is significant, as in the case of bottom topography (wedges, ridges and seamounts), eddies and fronts.